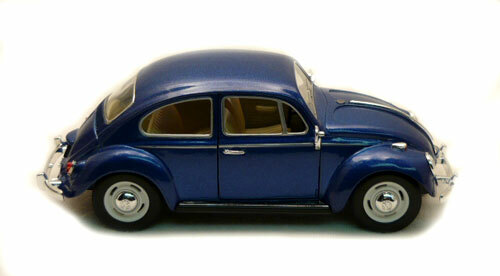 This is a 1967 Volkswagen Bug 1:24th Scale by Kinsmart. This Classic VW Beetle has doors that open to a detailed tan interior with black steering wheel, shifter and emergency brake. The wheel are white with chrome moon VW hub caps and black wall tires. It has the stock running steps that are black and chrome. = 6.75" Long x 2.5" Wide x 2.5" High.